While it’s always important to take care of your oral health, it is especially important to keep a healthy mouth during cold and flu season. Here are some tips and tricks to avoid cavities if you or your child gets sick. Toothbrushes and electric toothbrush heads should be replaced every 3-4 months, but might need to be replaced sooner if you’ve been sick. The flu virus can live on your wet toothbrush bristles for 72 hours. Sugar free cough drops are a great way to help suppress a cough and soothe a sore throat without coating your teeth in sugar and cavity causing bacteria. Try to stock up on sugar free drinks and popsicles for your kids. Brushing your teeth immediately after vomiting can actually spread stomach acid on your teeth. Try to wait 30 minutes before brushing. If you find it hard to wait 30 minutes, try swishing with water, or a mouthwash diluted with water. Dry mouth is commonly caused by cold and flu medications. Dry mouth may also cause cavities, so it is important to keep your mouth hydrated. Drinking lots of fluids, sucking on sugar-free lozenges, and purchasing a mouthwash designed to prevent dry mouth are all great ways to prevent cavities while you are sick. They best way to stay hydrated and maintain your oral health is to drink plenty of water. Try to limit sports drinks, or chose low sugar or sugar free drinks. Always brush your teeth after drinking warm drinks like tea or coffee to avoid stains, and try to avoid adding sugar. 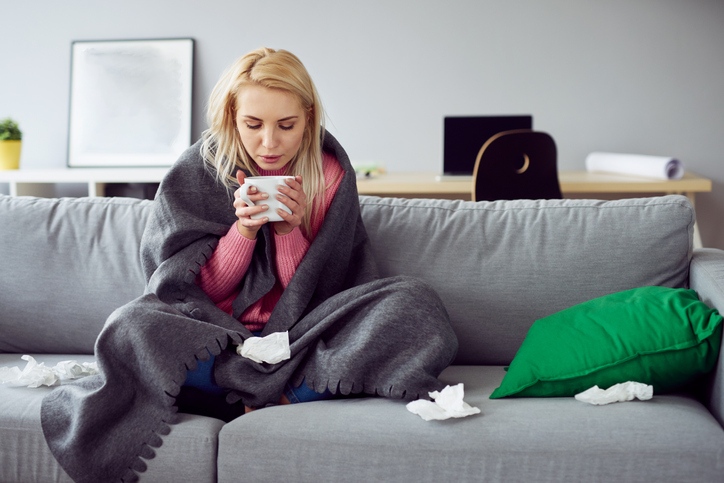 We understand how hard it can be to take care of your teeth when you are under the weather. Routine cleanings and sealants are other helpful ways to protect your teeth, as well as your child’s before falling ill. To schedule preventative care, call our office today at (903) 758-8770. If you do get sick, please reschedule to protect the health of our staff and patients. Our entire staff has had their flu shot this flu season to protect the health of our patients.